Melissa's Mochas, Mysteries and Meows: Are You Old Enough to Drink That, Mudpie? Is that really Waffles on that can!! Cool! Mom just started following his blog! We don't think you want to drink that stuff. Oh Mudpie glad you have one of those cans. They are terrific, aren't they??? Great picture of you. How pawesome! Now you can look at Waffles whenever you want, Mudpie. And I don't blame you if you do. Purrs! the mom says that it will make you silly if you drink it. Don't go imbibing too much or you could have a headache in the morning! It is so cool that she sent you one of these! I still can't find one around here, either. If I had one, I'd hold onto it forever. I've been looking since they came out and never found any. I think They skipped my state for distribution- I even went to four different liquor stores! Mudpie is one lucky kitty!!! Whoa! Glad it came. I bet the postman drank the contents too. MOL! That's so cool! We're still looking here. Oooo, you are so lucky. I gotta find one of those. Can I have a little sip? You are so lucky! Those are hard to find. We still have a Waffles' can in our office at home. FUN! We drank our last one a few months ago! Looks like something Doodle Dad would enjoy! 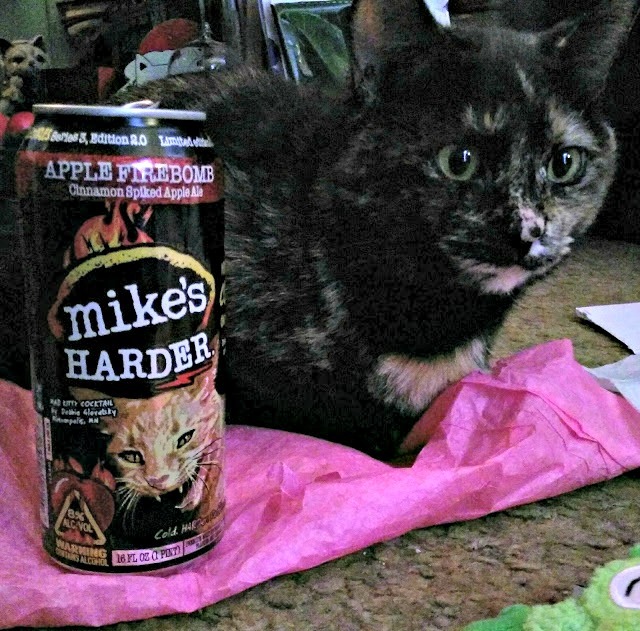 Now, Mudpie, I hope Mommy told you no drinking and driving, and certainly don't mix this with catnip! !